The Carlisle Coaster is the quintessential representation of Yuling’s signature style that carefully walks the line between eclectic and restrained. The checkered, two-toned design is paired with stripes and tied together with sunburst detailing and a copper foil-stamped border. The piece is flat printed single-sided on duplexed double-thick cover stock with a subtle eggshell textured finish with a delicate border richly foil-stamped in a metallic copper sheen. 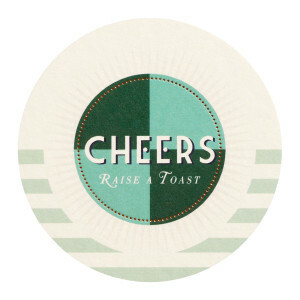 $595 for 100 two-ply flat printed and foil stamped, or $407 for 100 two-ply flat printed Coasters.